Three Complimentary Kayaks and 4 Bikes Available for your Convenience! 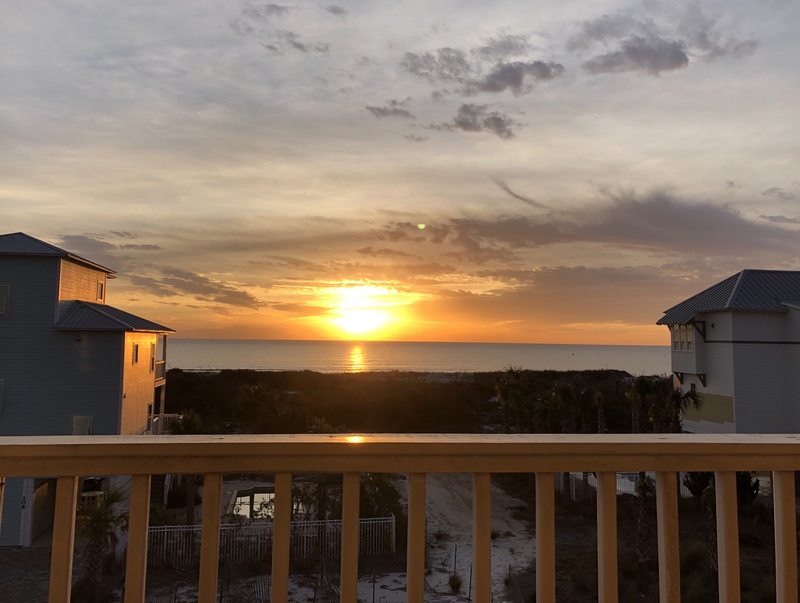 Veranda Views, formerly know as Tranquil Seas, is a spacious, light-filled 5 bedroom/3 bath home in the Seagrass Community on Cape San Blas. This gulf view rental home also features a private pool which can be heated with additional fee as well as the community pool located adjacent to the Seagrass Clubhouse. On the exterior, you can enjoy the gulf views from one of the 2 levels of wraparound porches. 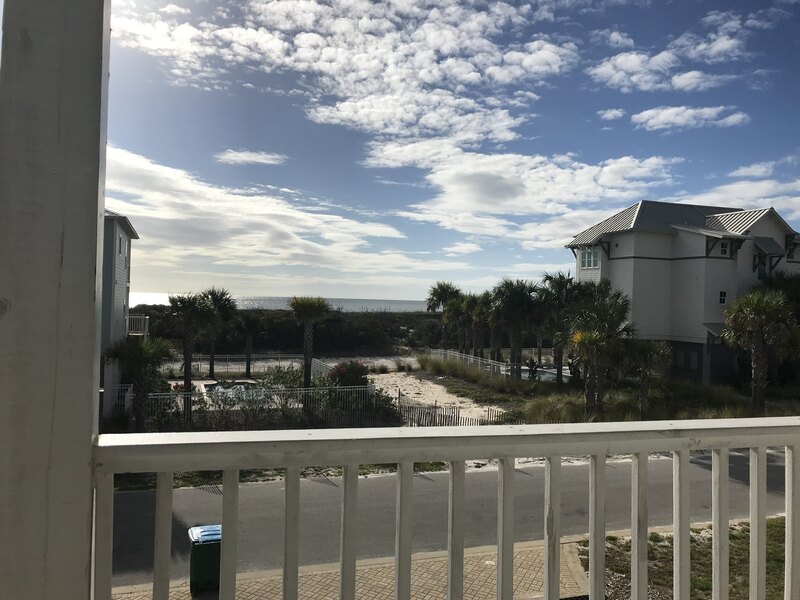 Conveniently located, Veranda Views is just a short walk (150 steps to the private Seagrass boardwalk) to the beach and to Weber’s Donuts, the Cape Tradin’ Post and to the walk/run/bike path that stretches for 8 miles. As a convenience to you, 3 complimentary bicycles are provided. On the ground level you will find a private king bedroom suite complete with private bath and walk-in closet. There is also a large laundry with full size washing machine/dryer and ironing board. On the outside there is an enclosed hot/cold outdoor shower and a foot-washing station, ample covered parking for multiple vehicles plus a paver parking pad for a boat and a gas grill and shaded picnic table. On the main level enjoy sunset views from the veranda. With an open floor plan, guests can spread out in the kitchen and dining areas and the light-filled, 2-story family. Seating for dinner will be comfortable with a farmhouse dining table seating 10 as well as the kitchen island lined with four chairs. If you prefer to take your meal outside, there is gulf view dining on the veranda that includes a bar-height table for four and a dining table for six. The fully stocked chef’s kitchen contains granite counters and stainless steel appliances. On this level there are two bedrooms. One with a queen bed and a private door to shared bath and the second is a bunk room with a twin bunk a separate twin. The shared bath has double vanities and step-in tiled rainfall shower. For extra sleeping there is a sofa sleeper in the living room and those working while on vacation, there is a writing/computer desk for your use. The top floor houses the beautifully decorated, gulf view master suite with extra-large walk-in closet. The master bath includes a jetted tub for two, step-in rainfall shower, double vanities, private water closet and linen closet. The private veranda is perfect for gazing at the gulf or taking in a sunset with wicker seating for 5 and 4 bar-height Adirondack chairs. There is also a bunk room with a duo and beautiful bay views. My family and I enjoyed our stay in Cape San Blas. We are definitely coming back soon! Two friends and I met up for some R & R at Veranda Views. We enjoyed exploring the coast, walking on the beach, sipping wine on the porch watching glorious sunsets, and cooking dinners together. Veranda Views is spacious and comfortable, with lots of interesting artwork to enjoy. Great home. Great and very helpful staff. Excellent views and location, there was an ant problem that eventually got taken care of and the cleanliness wasn’t what I had hoped for, the bathroom showers need some deep cleaning. Other than that, it was great. This property was just what our family needed for our family vacation. Everyone had space to spread out but we had so much room in the kitchen and family room to hang out and be together also. We loved to pool and the short walk to the beach, I felt comfortable sending my oldest child and his friend back to the house when he was ready from the beach. Thank you for sharing such a great house with us to make so many family memories in. We will be back. Birthday Vacay! Had a wonderful time. House was great! Pristine Property was wonderful! They went over and above to accommodate my request. The only downfall of the location is the travel time to town/restaurants, 20-30 min drive one way. We’ve stayed in this home twice and have enjoyed it! The locations is perfect and the home is very nice! We love the new decor. My family and I just returned from a week stay at the lovely Tranquil Seas home in Cape San Blas, Fl. 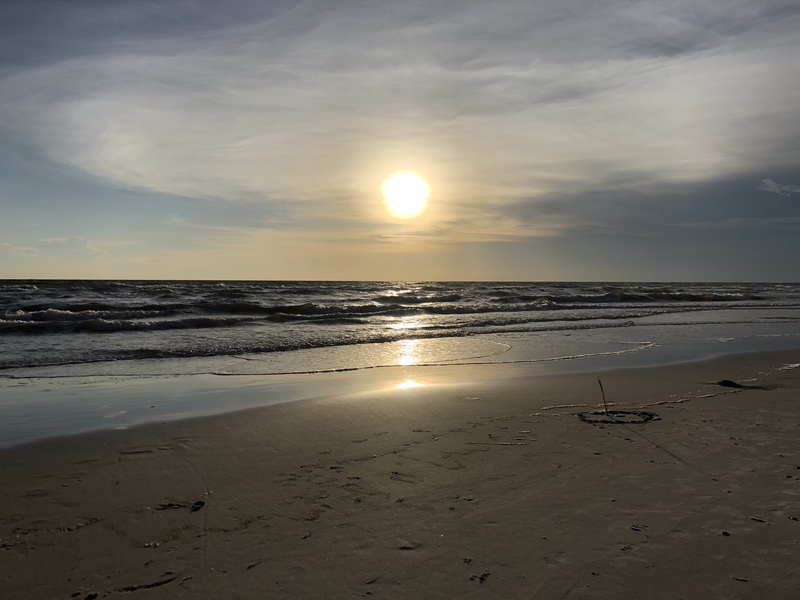 This was our first time visiting Cape San Blas and fell in love with the area. We have always vacationed in PCB and Destin but found Cape San Blas to be very relaxing and enjoyable. My 2 year old twin granddaughters have decided this is "their" beach house. I have been looking at other houses since returning on Saturday and have come to the conclusion that for our families needs this is the best house for us and everyone agrees. We love the neighborhood, the carport and the privacy of the downstairs bedroom. It was perfect for our family. I would love to rent this home again next year for our family vacation.